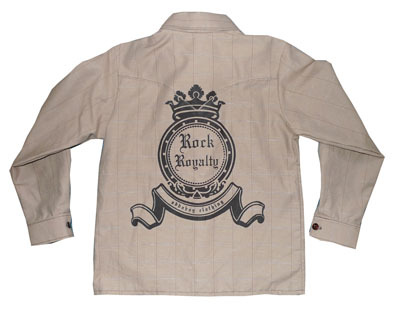 The "It" button-down for the season: Addaboy's hemp/cotton shirt with Rock Royalty print on the back in a soft caramel colour with fine burgundy, cream and blue lines. We kinda like to think of this shirt as a mullet: business at the front, party at the back. All Addaboy shirts are designed and made in Canada. Three left.